Toyota Car Club of Australia - Victoria | Page 21 of 21 | A home for vehicle and motorsport enthusiasts since 1975! 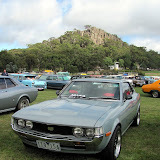 5 members and 4 cars from TCCAV made the trek to Sydney recently for Toyotafest. A great day was had by all, with lots of salivating done over some gorgeous cars at the show. Another great social meet, plenty of nice cars out in the early Sunday morning sun. Great venue, good coffee and some cool cars. Get along to the next one if you missed this one! Third Sunday of every month, venue announced on the website. Last Sunday was the hugely popular Picnic at Hanging Rock car show. Some 3000 cars turn up every year and this one was no exception, with late comers being turned away. Thanks to the combined efforts of TCCA, the Toymods and rollaclub forums, and a few new faces, we had a great turn out of Toyotas, 32 together and then a few others scattered through out the venue. Big thank you to Ian for organising the cruise and having it all work exactly to plan. Here are a few highlights from the day.. all the Toyotas were cool, these were some of my favourites…. How cool is a chocolate brown *E7* I ask you?! Tate’s Crown just gets better and better.. these rims are horn!! Justin’s MS55 Crown is sooo clean. I continue to love this model… do want! and last but not least… how clean is this.. not your average 78 Corolla! 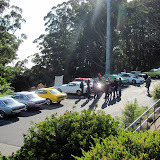 If Hanging Rock wasn’t enough for you or you missed out, we are having our monthly Cars Coffee and Donuts social meeting this coming Sunday, 20th Feb 2010. We will be meeting at the Jolly Roger Sailing School carpark at Albert Park Lake, at 8.30am. See you there!